The Andaz hotel in London’s Liverpool Street is a beautiful 19th century red-brick building, just made all the more remarkable by an interior refurb designed by Conran and Partners and fitted out by Fileturn. This was a significant return to the Andaz for Conran and Partners, who had worked on the hotel two decades earlier – so much so that Sir Terence Conran himself came to oversee elements of the work in person. Originally built in 1884 as one of London’s landmark railway hotels. 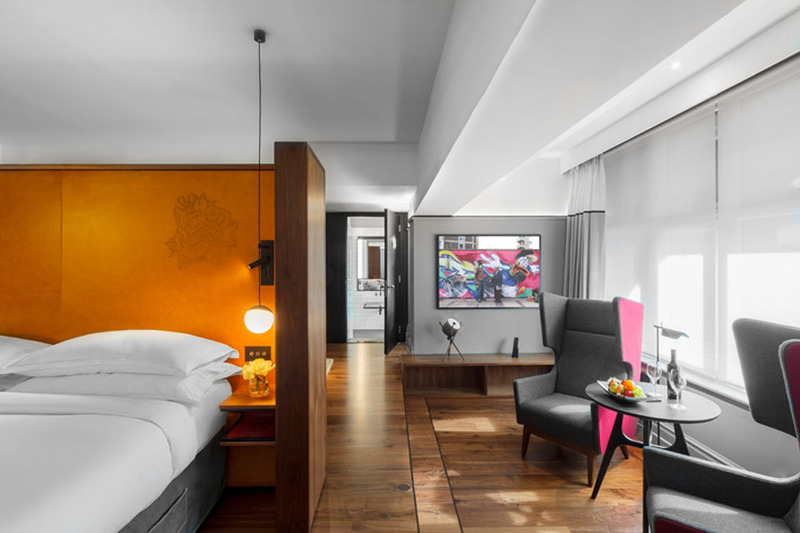 The Andaz, now owned by Hyatt, stands on the border of two very contrasting areas of the capital: the City of London, with its conservative traditions, and Shoreditch, with its hip, arty scene. The hotel design reflects this contrast, with wood panelling and pinstripes juxtaposed with tattoo art and concrete elements. Working particularly closely with the hotel team, Fileturn was engaged to fit out the 267 bedrooms, including the Red Room Suite, designed and overseen by Sir Terence Conran himself. All the rooms were stripped out and refitted with new M&E, new case goods and carpets. Curtains, blinds and shutters had to be made bespoke to fit the variety of windows, including some circulat windows which required bespoke electric blinds. The level of detail required of our fit-out specialists included leather headboards, embossed with a subtle pattern and the horizontal wall stripe that aligns perfectly with the stripe in the curtains. Existing bathrooms were stripped out and fully tanked, replumbed and tiled with the white metro tiles from the original design. Modern features such as black powder-coated Dornbracht brassware, commissioned specially for the hotel, and contemporary floating sinks by Laufen added a contemporary twist. Walk-in showers replaced the old baths and all the bathroom mirrors were made bespoke and fitted with light strips. The completion of the 267 guest rooms was phased over 12 months and we were pleased to deliver the rooms on time and to budget.